Apple has showed continued interest in using hydrogen fuel cell technology to power its portable devices, echoing a functional iPhone 6 powered by hydrogen that was showcased just last week. Published by the U.S. Patent and Trademark Office on Thursday, the application was originally submitted by Apple in March, and actually represents a continuation of two patents from 2010, one of which was previously spotted by AppleInsider. Text and diagrams depict not only a fuel cell stack for generating power, but related aspects like connections with the portable device and a cartridge system for adding fuel. The diagrams make reference to a MagSafe connector, implying that technology would be oriented towards MacBooks, and claim that a device could run for "days or even weeks" without refueling. Recently, however, British firm Intelligent Energy developed a prototype iPhone 6 pairing a fuel cell with a rechargeable battery. The company has reportedly been working closely with Apple, though neither party has been willing to comment on that claim. Intelligent Energy's system would use an ultra-thin stack, and disposable cartridges containing enough fuel powder to run an iPhone for a week. 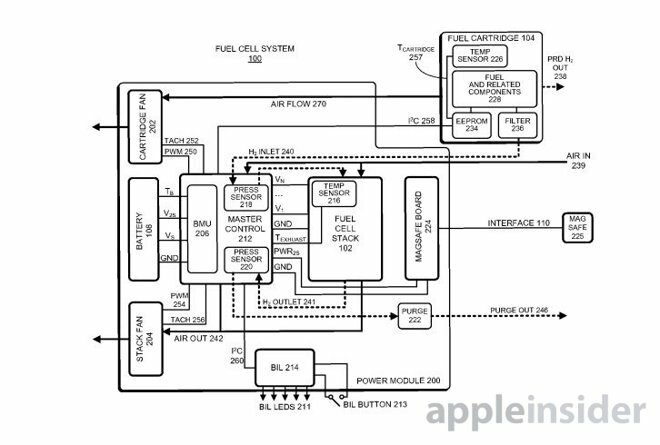 The likelihood of Apple putting fuel cell technology in a shipping product is uncertain, since cartridge slots would take up valuable design space, and many people might prefer to keep recharging via USB instead of paying for fuel. There also might also be outsized manufacturing and environmental costs in producing a supply of cartridges. However, Thursday's patent continuation makes it clear that Apple remains interested in pursuing the concept, as the company strives to make more environmentally friendly products that also offer greater runtime between recharges.